A little long, bear with me... there's a lot to see! 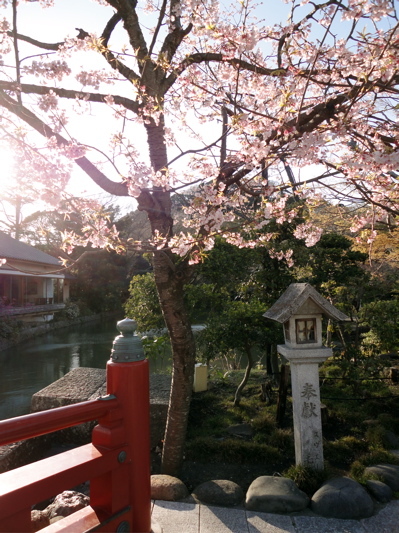 One of the pleasures of living near Tokyo is the ease of escape. Take the Yokosuka line from Tokyo Station or the Shonan Shinjuku line from Shinjuku station and within an hour you can experience the laid-back, beachy atmosphere. As a former capital of Japan, Kamakura has its share of historic temples and sights, but it’s also famous for food! 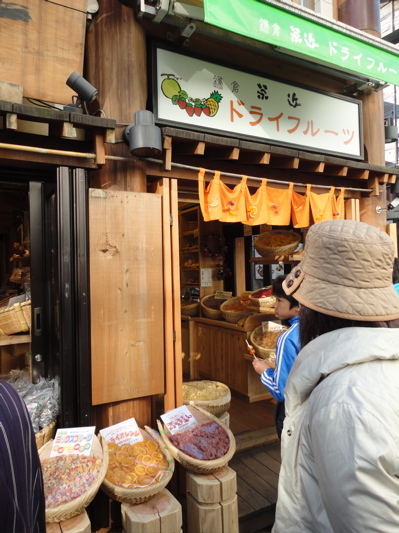 A stroll (necessarily slow thanks to the constant crowds) along Komachi street is essential for sampling sembei and sweets. First stop: Hase station to visit Hase Dera and the Daibutsu. The 3 car Enoden electric train has a nice nostalgic atmosphere as it rockets along a single line. Hase Dera has a beautiful garden all year round. We saw cherry blossoms this time, but in June / July, it has a spectacular display of iris flowers. As soon as you finish at Hase Dera, you should go back to the main street, cross over and turn left towards the Daibutsu (that’s “Big Budda”). Look for the oversized purple ice cream models. The popular flavour here is Murasaki imo, or purple potato. Slightly bland and sweet, it’s a nice refreshment for a hot day, but the real news here is the “Murasaki imo korokke” or purple potato fritter. 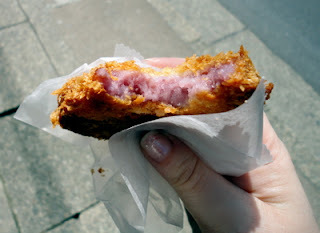 Now, I don’t know that Kamakura can really claim the purple potato as a unique local specialty, but these fritters – so crisp on the outside, and soft and hot inside, are worth a trip. 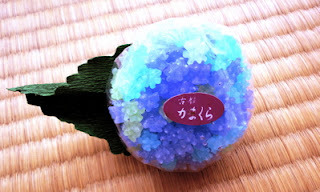 They cost about 150 yen each and sell out in the afternoon. Visiting the Daibutsu, you find that Japanese Buddhists aren’t too precious about their deities. 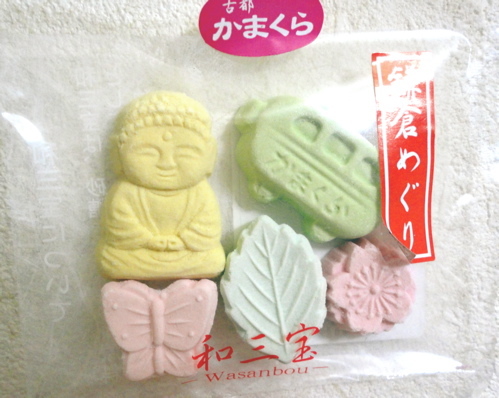 You can get Budda shaped wasanbon sweets (along with other local shapes like flowers and the Enoden train). Wasanbon is a super-fine powdered sugar that can be pressed into shapes. To be honest the basic flavour is just…sweet. But they look so pretty and they literally melt in the mouth. You can even get a Daibutsu lollipop! 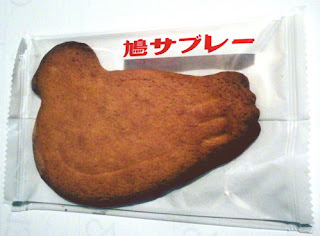 Back in Kamakura proper, you can’t miss the packaging for Hato Sable biscuits. 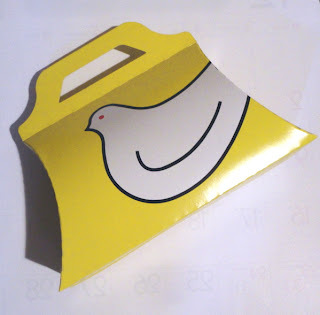 It seems like everyone is carrying a distinctive bright yellow bag with a graphic dove. Produced by Toshimaya company, the Hato Sable (or Sabure, as it’s written in katakana) has a long history. The store opened around Meiji 30 (1897) and it’s a good example of how Japan was opening up to the world. At that time, according to the company’s website, a foreign visitor gave the founder, Hisajiro, a biscuit as big as his hand, with an image of Joan of Arc. The founder didn’t want to imitate the biscuit but decided to somehow evoke the taste, which after some research and experimenting, he realised was down to the butter content. He experimented with the balance of ingredients and one day tried out a prototype on a friend who had just returned from Europe. The friend remarked that it tasted just like a sable biscuit he had tried in France. The word “sable” sounded like the Japanese name Saburo, which is a twist on the name Hisajiro (by re-ordering the kanji). And the Japanese love nothing more than a clever play on words. The store was very close to Tsurugaoka Hachimangu shrine, where Hisajiro often went. He noticed that kids were delighted by the many pigeons around the shrine and he was inspired to shape the biscuits like the birds (doves and pigeons are the same in Japanese – just different colours of the same bird). 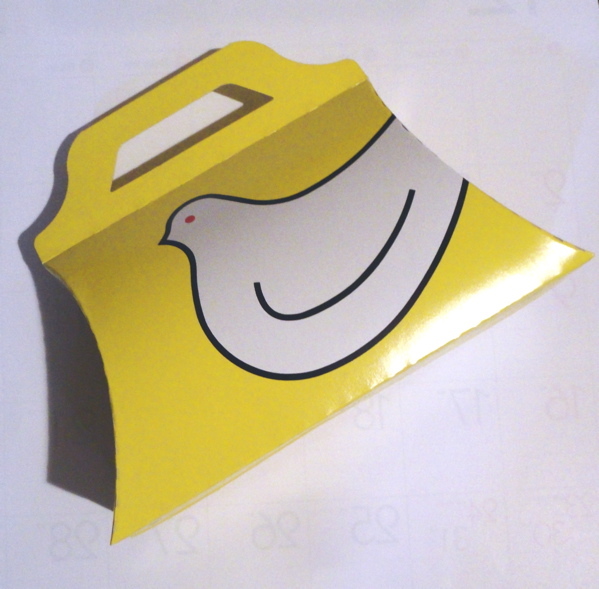 And so, the Hato Sabure was born, and it’s been a hugely popular souvenir ever since. Prices start at 450 yen for a pack of 5. They are BIG – about the size of an adult hand – and crunchy and buttery. The main store is on the road leading to Hachimangu shrine and there’s a shop right in front of Kamakura station. You can also buy them in major department stores in Yokohama and Tokyo I've seen them in Sogo Yokohama, at Tokyo Station (Daimaru, I think) and the ever-crowded Food Stage of Tokyu Dept Store at Shibuya Station. If you can’t get enough of the “Hato” experience, they have a café with a huge variety of sweets called “Hatokoji” or literally “80 Lane” just off Komachi street to the right. Sorry, I warned you it was a long post! Thanks for hanging on till the end.